Who's your bet for the Miss Universe 2016? I personally like Miss Thailand, Miss Malaysia and Miss Jamaica. We are just few days away from the grand coronation night. It's time to cheer and show our support for our very own candidate cheering Ms. Universe-Philippines, Maxine Medina. The Ms. Philippines sash is not a stranger to the spotlight. Amidst the win of 2016 Ms. Universe, Pia Wurtzbach, was a full blown controversy after her title was mistakenly awarded to Ms. Colombia. This became a trending topic all over the world, dominated by Filipino netizens who showed their support to the newly crowned Ms. Universe Royalty. We are praying that Ms. Universe-Philippine Maxine Medina will receive the most coveted crown. Even weeks before the pageant, Filipinos are already showing their support online by using the hashtag, #4M4MU. “We all know that the Philippines is not just a beauty queen-devoted country, it’s also a social media-obsessed country. We, as a nation, have always showed our support to our fellow Filipinos during momentous events through social media. And the Ms. Universe pageant is no different–which is why freenet is glad to enable Filipinos all around the country to participate in this much-anticipated event as we once again play host to the Ms. Universe pageant here in our shores,” said Heidi Garayblas, Business Unit Head at freenet, the free Internet platform of Voyager Innovations. freenet is taking all of us to a royal Ms. Universe experience through free access to some of the country’s top pageant sites and even a chance to witness the Ms. Universe coronation night live at the SM MOA Arena on January 30, 2017. Today until February 12, freenet users will be able to keep up to speed with the latest Ms. Universe news and updates in the run-up to the coronation night with free access to top pageant sites such as Missossology, among many others. Smart, Sun, and TNT subscribers can access these exciting and engaging content via freenet without having to worry about data charges. And to complete the experience, freenet is also giving one devoted fan a treatment fit for a queen through the freenet Miss Universe Royal Experience promo. 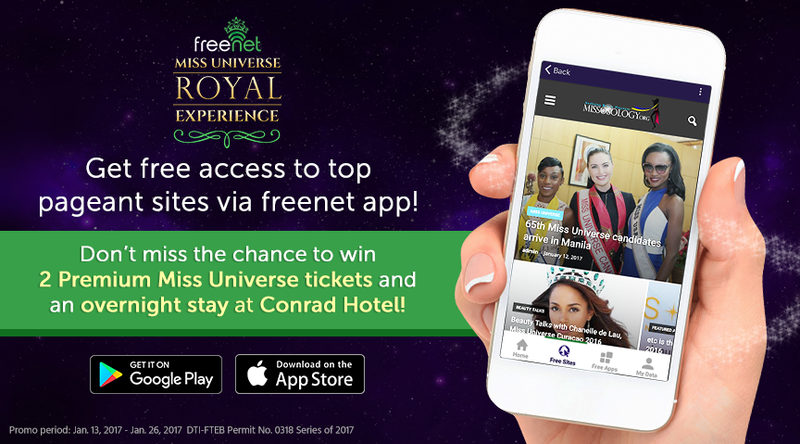 From today until January 26, fans who will download the freenet app and submit an entry form from within the app will stand a chance to win two (2) premium tickets to the coronation night, including an overnight stay at the nearby Conrad Hotel. For those who won't be able to watch the final event live, they can still chime in and show their support for the Philippines’ bet with free access to Facebook Lite, Twitter, and Instagram from within the freenet app. “Freenet is all about access. 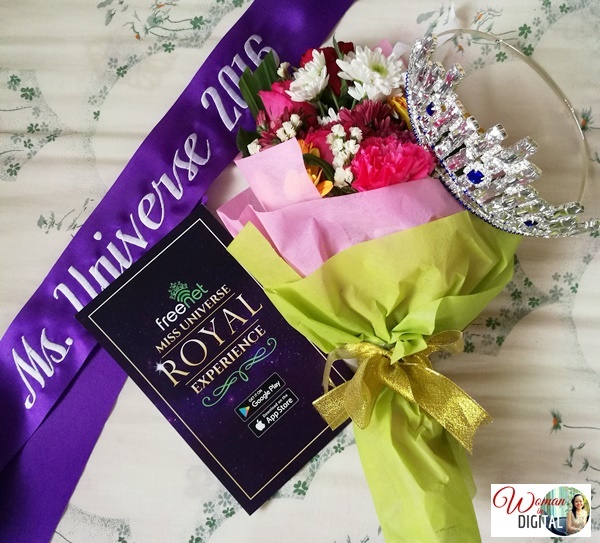 More than just allowing our users a way to access their favorite sites for free, we put a great deal of work in giving them ways to participate in momentous events like the Miss Universe coronation night,” Garayblas added. Watch the Miss Universe without data charges, simply download the freenet app on the Google Play Store and the Apple App Store, or visit www.freenet.ph.